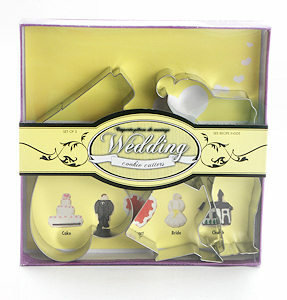 Celebrate the upcoming vows with style with this collection of 5 Wedding theme cutters. Perfect for fancy cookies or cutting your tea sandwiches into fun shapes. Great for a wedding shower tea. Set contains a wedding cake, groom, bride, heart, and church. Tin-plated steel.